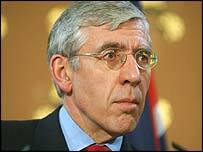 Foreign Secretary Jack Straw is in Sudan to put pressure on government leaders to resolve the humanitarian and security crisis there. The UN Security Council is threatening to impose sanctions from the end of August on the Sudanese government. The UN wants it to disarm Arab militias blamed for killing thousands of the black African population. Shadow foreign secretary Michael Ancram said the international community must act fast to avoid another Rwanda. Mr Straw is meeting Sudanese government ministers before travelling to a refugee camp in northern Darfur on Tuesday. Speaking about his mission, Mr Straw said: "What we need to see is concrete signs of the government of Sudan being really serious about implementing its obligations. "We want to see relief of the humanitarian crisis, we want the provision of safety and security for the internally displaced person." Mr Straw added: "There is a great deal more that the international community can do and will do if we don't see further evidence of good progress by the government of Sudan." For the Tories, Mr Ancram said he was concerned at what he described as a "lack of a sense of urgency". He told BBC Radio 4's Today Programme: "We are looking at a situation where literally thousands of people are in danger of dying, and a lot have died already." It would not be satisfactory for UN officials just to commission another report on the situation in Sudan, he said. "What we can't do, and I hope Jack Straw makes this clear, is just sit back and let the situation develop over a period of time." The UN should take action to ensure security especially in Sudan's refugee camps, that aid is getting through and to enforce a ceasefire, Mr Ancram said. He added that he believed an African-led forced, backed up with European logistics and support would be the best group to undertake peacekeeping operations. 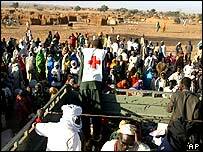 More than a million refugees have fled the war-torn Darfur region, with 180,000 crossing into Chad. Oxfam spokesman Brendan Cox said his organisation was pleased Mr Straw was making the trip but he added that the foreign secretary needed to bring pressure to bear in a bid to end the violence in Sudan. Foreign Office officials said the UN Security Council was reluctant to impose "heavy-duty sanctions", such as an oil embargo or travel bans, on Sudanese ministers. But a spokesman said member states would want to see "measurable, genuine compliance" by Khartoum. The UN's special representative in Sudan Jan Pronk is set to meet Mr Straw later on Monday. He told the Today programme: "There are mass violations of human rights and we have to stop these mass violations. There is no mass killing going on in this country but there is some killing." There was no reason, however, to believe the government was behind these killings, as in Rwanda 10 years ago, although it had been behind some of the instability, Mr Pronk said. The Sudanese conflict began in Darfur in early 2003 after a rebel group began attacking government targets, claiming that the region was being neglected by Khartoum. "Britain has an important part to play"